PITTSBURGH—Everybody who waits at a bus stop wants to know one thing: Where's the bus? Thanks to Tiramisu, a new iPhone application developed at Carnegie Mellon University, transit riders in Pittsburgh will soon be able to get the answer by using crowdsourcing to share arrival times with each other. Tiramisu — literally, Italian for "pick me up" — makes it easy for riders to use their iPhones to signal the location and occupancy level of the Port Authority of Allegheny County bus they are riding, in real-time. The new app was developed by researchers in the Rehabilitation Engineering Research Center on Accessible Public Transportation (RERC-APT), supported in part by CMU's Traffic21 initiative. It is available free through the iTunes AppStore. With Tiramisu, anyone waiting at a bus or T stop with an iPhone can see which buses or light rail vehicles are due to arrive next and, thanks to the signals from riders already aboard, get an idea of how long they have to wait. When a rider first activates the app, Tiramisu displays the nearest stops and a list of buses or light rail vehicles that are scheduled to arrive. The list includes arrival times, based either on historical data for that route or on real-time reports from riders. When the desired vehicle arrives, the user indicates the level of "fullness" and then presses a button, allowing their phone to share an ongoing GPS trace with the Tiramisu server. Once aboard, the rider can use Tiramisu to find out which stop is next and to report problems, positive experiences and suggestions. Tiramisu allows transit riders to create the information they want in collaboration with Port Authority of Allegheny County. It is a model for how citizens can help produce the public services and information they desire. The information available through Tiramisu is also critical for riders with disabilities. The fullness information lets riders who use wheelchairs know if there is space on the bus. Blind riders can use the app through the iPhone screenreader. "But the beauty of Tiramisu is that it provides information that is valuable not just for people with disabilities, but for every rider. This universal design approach helps everyone," said Aaron Steinfeld, a senior systems scientist in the Robotics Institute with expertise in transportation technologies. "It can even benefit non-riders, such as local shops, because riders will know if they have time to go into a store." Steinfeld is co-director of RERC-APT, a collaboration between Carnegie Mellon and the University of Buffalo, State University of New York, focused on the transportation needs of people with disabilities. In addition to Steinfeld, the Tiramisu development team is led by Anthony Tomasic, senior systems scientist in the Institute for Software Research, and John Zimmerman, associate professor in the Human-Computer Interaction Institute and the School of Design. Charlie Garrod, a computer scientist at Swarthmore College, collaborated on this project. During a field test on the Port Authority system in Pittsburgh's Oakland corridor, the RERC-APT team found that even a small number of riders along a route can provide useful, real-time information about buses. The information becomes richer and more useful as the number of riders using Tiramisu increases. The team also observed that participants in the pilot studies continued to use it even after the formal study ended. "Tiramisu is an exciting tool that will provide new types of useful information for Port Authority riders," said Port Authority CEO Steve Bland. "Collaborating with Carnegie Mellon University on research aimed at improving public transportation has been an exciting and fruitful experience, which we hope continues for many more years." Many buses today are equipped with GPS systems, but not all send that information in real-time to their transit operators. Commercial real-time arrival systems can cost tens of millions of dollars, which is prohibitively expensive for mid-sized systems such as the Port Authority, Steinfeld said. "While better funded transit systems, such as those in Chicago, Seattle and San Francisco, can afford to make GPS-based information available to riders in real-time, the Allegheny County system is under tremendous budget pressure," Steinfeld said. "Under such circumstances, a free, crowdsourced system such as Tiramisu offers an important alternative." Tiramisu was developed first for the iPhone, but the Tiramisu team will have a version for Android smartphones available soon. Though Tiramisu is being launched in the Pittsburgh region, the software architecture is designed so that it can be deployed to other transit systems. Tiramisu is among the initial projects to reach deployment with help from the Traffic21 initiative, which was created by Carnegie Mellon with support from the Hillman Foundation. It draws on expertise and resources from across the campus to stimulate a broad community partnership to identify, refine and deploy "intelligent transportation system" technology advancements to the Pittsburgh region's transportation system. The goal is for the region to become internationally recognized as the place for "smart transportation," thus attracting further investment in both research and commercialization. "This technology will benefit every transit rider in Pittsburgh and it is ready to be deployed today," said Rick Stafford, director of Traffic21 and distinguished service professor of public policy in CMU's Heinz College. "Crowdsourcing makes it possible for riders to provide real-time updates about how the bus system is actually functioning on any given day by simply sharing information with each other." RERC-APT is sponsored by the U.S. Department of Education through the National Institute on Disability and Rehabilitation Research. In addition to Traffic21, support for Tiramisu came from IBM, Google, the National Science Foundation's Quality of Life Technology Engineering Research Center, and the SINAIS project, a joint research project between Carnegie Mellon and the University of Madeira. 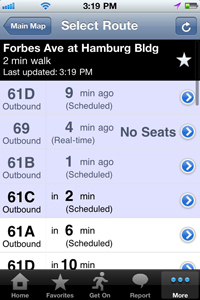 Pictured above is a screenshot of information on the Tiramisu app for several PAT buses.